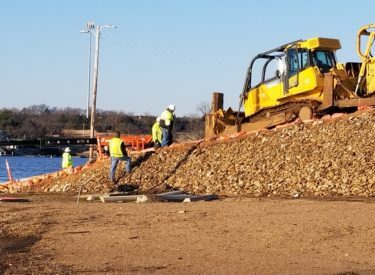 The deep water ramp that has been under construction at Lake Ponca was pushed into the water Tuesday morning with the help of a lot of heavy equipment. Bulldozers and other equipment from Sober Brothers and Crow Dozing lined up to muscle the massive concrete slab down the hill on which it was poured and into the lake. Some 108,000 pounds of concrete went into the making of the ramp, built by Sober Brothers for $225,000. City Engineer Jim Fairbanks told the Planning Commission on Feb. 5 that the ramp is reinforced with 1/2-inch rebar and was built by Sober Brothers on a plastic liner to make moving it into the water easier. Grooving was poured into the surface of the ramp to allow water to drain off the surface. The ramp, he said, is 67 feet long and 28 feet wide. It is 48 inches thick and weighs 94 tons. A second slab will be poured on the bank of the lake and connect with the underwater slab in a key lock design. The slab pushed in today will be 10 feet under the surface. The ramp was built to accommodate boaters during periods of low lake levels. By extending the ramp out with this slab, boaters will be able to launch even during drought periods which have previously made it difficult or impossible. The ramp is Phase 2 of several projects in this area of Lake Ponca adjacent to the swim beach on Checkstand Road. In Phase 1, a new sewer line, rest room, water and electric service were added to this area, and a 10-stall boat parking lot was built so boaters can park their vehicles and trailers away from the ramp after launching. This work was done by Sober Brothers. There will be a new dock to the side for entering and exiting boats. A year ago, in February 2018, the City Commission approved the submission of a grant application to the Oklahoma Department of Wildlife Conservation for construction of Phase 2. Ponca City’s share was 25 percent and the ODWC share was 75 percent. The city’s share was funded by both in-kind services and cash estimated. The City provided all engineering, survey, design, and inspection services as well as grants administration services. ODWC approved the funding for the project in September 2018 and construction began shortly after.